As you may have heard, DARPA, the wonderful government agency folks who helped bring us the precursors to the internet and self-driving cars, held a giant robotics competition this weekend, known as the DARPA Robotic Challenge, or DRC. It was full of amazing robots -- though everyone seems focused on the ones that fell over, despite the amazing advancements in robotics that were on display. 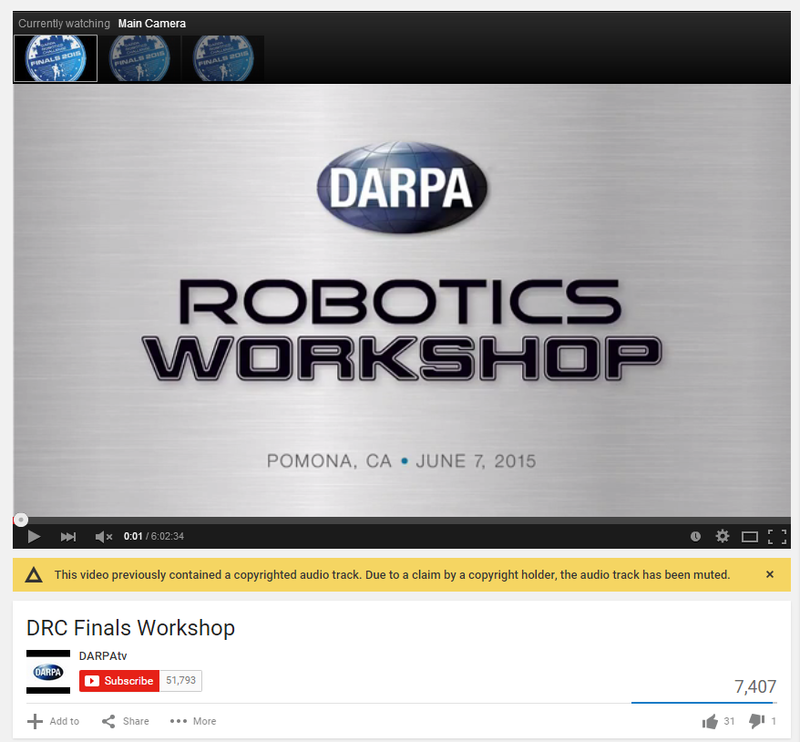 One bit of "robotics," whose best work is not on display, is the robotic nature of YouTube's ContentID copyright censorship. If you go to check out the six hour YouTube video of the DRC Finals Workshop on YouTube you'll get to witness everything, but not hear a damn thing. Because, apparently, there was a copyright-covered song playing somewhere in the background, YouTube muted the whole damn thing: So, yup, rather than learning about the latest advancements from our soon to be robotic overlords, we'll just silence everything so someone's copyright isn't infringed because it was playing quietly in the background at a daylong event. Let's be clear about what's going on right here and now: The creation of robots BY human beings to CONTROL human beings. This is not any sci-fi paranoid rubbish. This is delusional, severely insecure, overcompensating HUMAN BEINGS finding new ways to dominate and destroy their fellow human beings. It's called the self-destruction of the human race. No robot overlords required. Please keep that in mind.